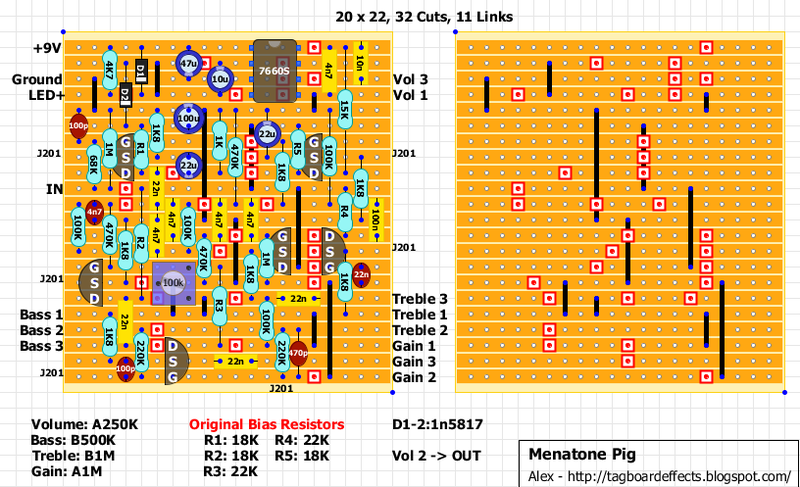 Here is the Menatone Pig overdrive. There are two layouts: one with trimpots to help bias the JFets (would start at 9V) and one with fixed resistors (probably need to test different values to bias the JFets properly). I've also added a charge pump (it works at 18V). You can find the original thread from FSB here. I had no idea that this was traced. Must build!! 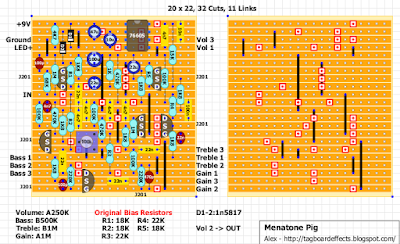 There is another stripboard layout (sans trimmers) around. I've built that before, but Alex's layout is again way better than the previous version. Another one to add to the "to do" list. Thanks Alex! J201. They're all labelled on the edges of the board. I just built the board with trimmers. It's verified. Nice work Alex! Sounds pretty damn good. Pretty much just like the demo. I used PN4393 to verify since I didn't feel like soldering up the SMD J201 boards. They work fine.